Please bear with me. I’m trying something new. Because I can’t visualize what will happen after I follow instructions, I have to experiment. This may take several tries. Just ignore me and speak among yourselves. If there’s no one to visit with, feel free to observe this mouse. 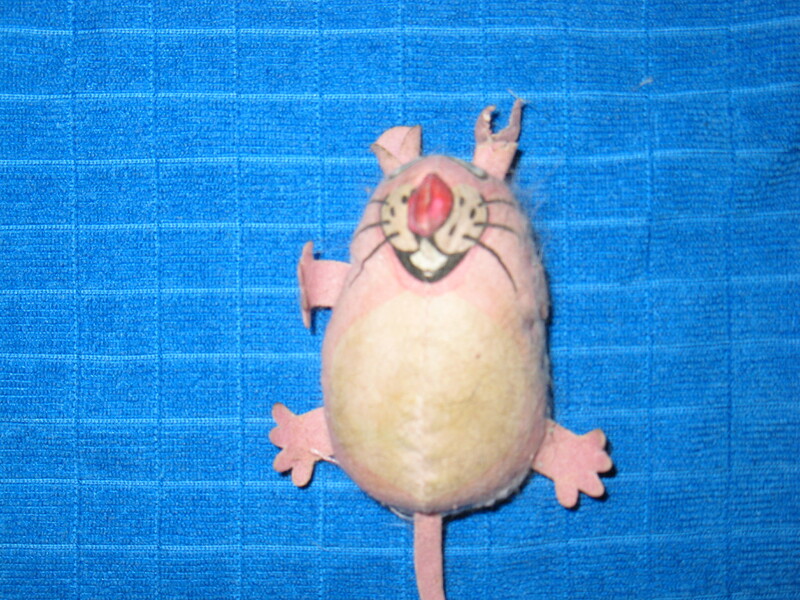 He was a favorite toy, but one of his owners stuffed him under the refrigerator, and when I found and released him he looked pretty grubby and had lost a leg. I intended to send him to Toy Mouse Heaven but obviously forgot, because a couple of minutes ago I noticed him staring up at me from the bottom of the toy basket. Yes, they do. Especially the dirty pink ones. But I can’t deprive my cats of their treasures. He is a cool mouse, Kathy, and has enriched my grey English morning. Thank you. Whatever you were trying to do, I hope it worked.